Dr. Christina Canales is an Alabama transplant from Texas and is happy to call Madison her new home. She graduated with a Bachelor of Science degree in Chemistry from the University of Texas at Austin (yes, that makes her a longhorn despite her lack of football knowledge). She briefly considered a career in research and academia before discovering her love of optometry. She went on to complete her Doctor of Optometry degree from the University of Houston College of Optometry. Dr. Canales strives to provide excellent care with a warm, welcoming smile. 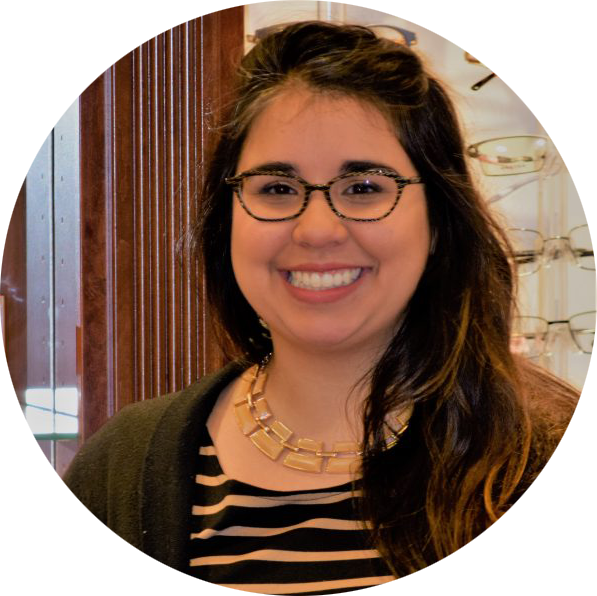 She is a member of the American Optometric Association, the Alabama Optometric Association, and the North Alabama Optometric Society. Dr. Canales attends national conferences to stay current with advances in optometric technology. Feel free to ask her about the latest contact lens materials and designs available. Her humanitarian work in optometry has taken her as far as Honduras to provide eye care to less developed regions. Outside of the workplace, she is active in her swing dance and church communities. Dr. Canales’s attention to detail enhances her ability to provide a thorough examination of external and internal ocular structures. She can diagnose and manage ocular disease like cataracts and glaucoma as well as systemic diseases like diabetes and hypertension. Based on those results, she coordinates care with other health care providers including primary care physicians, endocrinologists, rheumatologists, neurologists, dermatologists, and ophthalmologists. She has the training to treat ocular emergencies and prescribe topical and oral medications for those conditions if warranted. She aims to help patients attain clear and comfortable binocular vision. She prescribes glasses and contact lenses for eye conditions like near sightedness, far sightedness, astigmatism, and presbyopia. She is skilled in fitting both soft and rigid contact lenses. Additionally, she has been trained to use these devices to slow down the rate at which near sightedness progresses in children and teens; a field known as myopia control. Her motivation, dedication to patients, and Spanish fluency makes her an added asset to Advanced Eye Care.